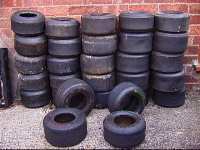 The Free Kart Tyres Offer is now CLOSED! As of 24/4/02, the "Free Kart Tyres" offer has been withdrawn for good. 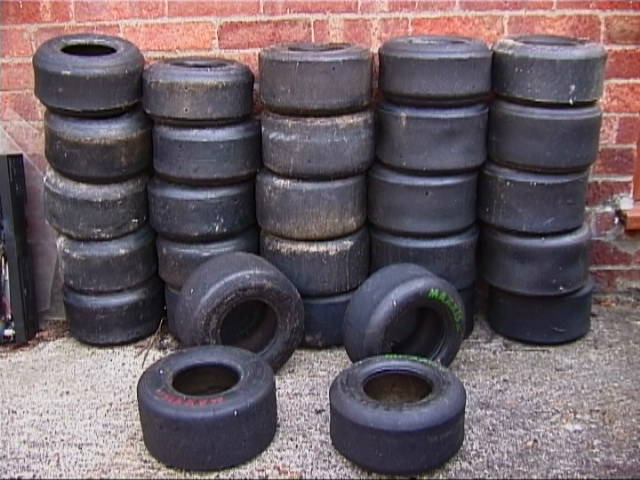 We simply don't have the time to organise getting hold of tyres for other teams or to send them out. Sorry everyone; all I can say is we helped out all those we could when we did have the time. 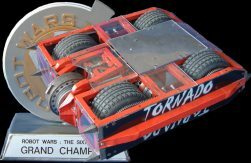 Tornado uses go-kart front wheels and tyres. We use slicks and wets, depending on expected arena conditions at the event. 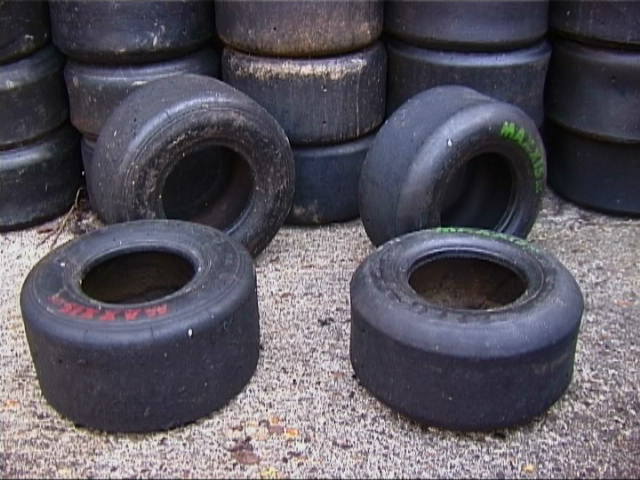 We get our tyres from kart tracks after racing meetings, after the racers have thrown them out. These are good because 1) they're free, 2) often they're not completely worn out, but because they're part worn they're lighter than new ones and 3) racing tyres are a lot softer and grippier than the leisure ones that you'll buy cheaply or might get given by public rental circuits. When we visit a track, we pick up everything that we find that isn't too worn out. This gives us a good selection from which to make the best choice for the coming events. The above photos give you an idea of the different types of slick tyre - the close up shot on the right shows a wider contact area type tyre on the left and a narrow contact area type tyre on the right - both happen to be made by Maxxis.